Enter Our Holiday Contest for A Chance to Win Style and Safety! To show our appreciation for all of our loyal return customers, plus any new customers or shoppers of ours at StickyJ.com, we’re putting on a holiday contest for a chance to win one of our beautiful medical alert bracelets! The details on how to enter the contest are listed below. At StickyJ Medical ID, we specialize in customized medical ID’s. 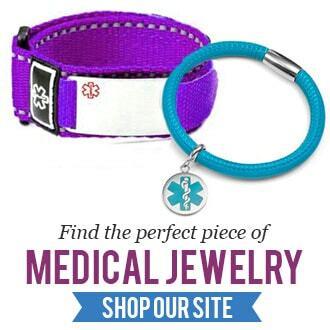 From medical bracelets to necklaces, to emergency wallet cards, you name it, we carry it. It’s our pleasure to serve our community by helping everyone to keep their safety in tow and their minds at ease with our stylish, comfortable, affordable, and lasting medical IDs. The item up for grabs in our holiday contest this year is one of our most popular choices in emergency IDs for women — our personalized stainless steel bar bracelet with a red medical symbol. This minimalist style bar bracelet looks fabulous with a variety of fashion choices for everyday looks or if you have a formal event to attend, it’s demure styling pairs beautifully with dresses and pretty blouses. This engravable medical ID can be laser engraved with your health safety details both on the front and back sides. It’s adjustable to fit many wrist sizes and is made of durable stainless steel to last you for years to come! Entry to the contest is simple! First, visit our Facebook page. You’ll see our holiday Giveaway contest for this medical ID bracelet pinned to the top of the page. To be entered, you’ll need to share the contest with your friends, then tag a friend in your shared post. The final step — is to direct message us with your email address. Once all these steps have been completed, we’ll enter your name into the contest. The winner will be randomly determined and the contest will run for approximately two weeks. The contest winner will be contacted directly to discuss engraving choices for their new medical bracelet and to obtain the best shipping address to mail it to. Best of luck, please feel free to comment below with any questions! Our Top Five Medical IDs Under $50! Six Alcohol Alternatives for Fighting Holiday Stress!